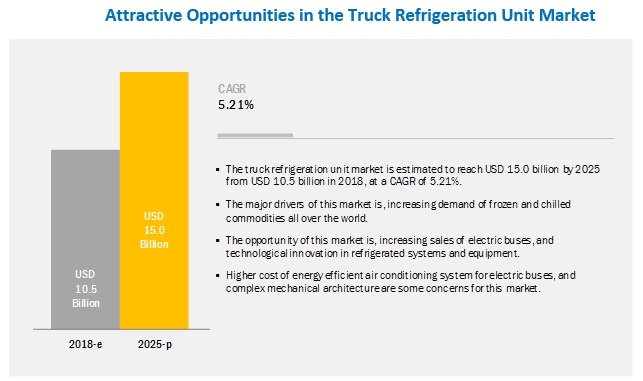 [172 Pages Report] The truck refrigeration unit market is estimated to be USD 10.5 billion in 2018 and is projected to reach USD 15.0 billion by 2025, at a CAGR of 5.21%. The demand for refrigeration unit is driven by the increasing vehicle sales, falling transportation cost, and rising cross-country imports, and exports of perishable goods. 20-feet trailers are the most popular sized trailers, which are widely used for the transportation of various goods along with perishable items. The 20-feet trailers offer advantages of low cost, improved fuel efficiency, better control, and maneuverability among others. With the increased goods’ trade worldwide, the 20-feet trailers are an ideal choice for goods transportation owing to the aforementioned advantages. According to the United Nations Conference on Trade and Development (UNCTAD), the global container transportation market has increased from 118.0 million Twenty-foot Equivalent Units (TEUs) in 2006 to 180.0 million TEUs in 2016, at a CAGR of 4.31%. Owing to its benefits over the 40-feet trailer, such as minimal cost difference with almost similar weight carrying capacity, the 20-feet trailers market is anticipated to remain prominent in the future. The frozen food segment is expected to be the largest contributor in the LCV refrigeration unit market, by industry verticals, during the forecast period. For transportation of frozen foods and vegetables, pickup trucks are generally used for the transportation within intracity and intercity distances. The suppliers offer several temperature variations options ranging from -25 degree centigrade to +5 degree centigrade. Hence it becomes useful for a variety of items such as meat, ice-cream, dairy products, and frozen snacks. Thus, owing to changing consumer preferences and cross culture diversification, the frozen packed eatable items market is expected to grow worldwide that would consequently boost the LCVs refrigeration units market to cater to the requirement for frozen foods. The Asia Pacific region is projected to lead the truck refrigeration market during the forecast period owing to the highest consumption of frozen and chilled products compared to other regions such as the Americas and EMEA. Commercial vehicle sales in the Asia Pacific region has increased by 12% from 2015 to 2017. Moreover, increasing investments in the development of smart cities in the developing countries, such as China and India, is also driving the air conditioning unit market for bus. Further, changing lifestyles, increasing spending power, and demand for convenience, among others, are driving the market for frozen food, snacks, fresh vegetables, which, in turn, is driving the refrigeration unit market. Some of the key players in the truck refrigeration unit market are Daikin (Japan), Carrier (US), Thermo King (US), Denso (Japan), Webasto (Germany), Mobile Climate Control (Sweden), Subros (India), Sanden (Japan), Klinge (US), and Utility Trailer (US). Carrier is anticipated to be a dominant player in the truck refrigeration unit market. Carrier adopted the strategies of new product developments, supply contracts, joint ventures, and collaborations to retain its leading position in the truck refrigeration unit market. Carrier is following the strategy of strengthening the product portfolio and global presence by building customer relationships to maintain its leadership position in truck refrigeration unit market. This has helped the company left a mark not only in the current market but also in emerging markets such as India and China. In June 2017, Daikin Australia Pty., Ltd., a subsidiary of Daikin, entered into an agreement to acquire an Australian company, Air Master Corporation, for refrigeration and air conditioning businesses. In June 2018, Thermo King expanded its ThermoLite solar panels portfolio with a more powerful, 110 W model designed to provide a sustainable power management solution for reefer units while reducing their fuel consumption and CO2 emissions. In December 2018, Utility Trailer launched a 20K Duct Floor System. It is a new standard floor on the 3000R base model refrigerated trailer. It is also the highest-rated standard floor in the industry, and its design keeps the 3000R lightweight because the floor requires no other structural enhancements. Some features of 20K Duct Floor System are a 20,000-lb. floor rating capacity for fork trucks with 12” wide front tires, aluminum duct floor planks, which have 30% more upper wear thickness than Utility’s prior 16K standard floor results in increasing service life and delivering optimal performance. Which type of refrigeration unit is preferred in LCV, and which type will dominate in the future? How are industry players addressing the challenge of keeping low maintenance cost and energy efficient systems? What is the adoption rate of refrigeration units in M&HCV and trailers across Asia Pacific, EMEA, and the Americas? What is the market size of the air conditioning unit for buses, in terms of value and volume? Which industry type will dominate the market in the coming years? *Details on B Business Overview, Products Offerings, Recent Developments & SWOT Analysis Might Not Be Captured in Case of Unlisted Companies. The study involves 4 main activities to estimate the market size of the truck refrigeration unit. Exhaustive secondary research was done to collect information on the market, such as vehicle type, system type, applications, and industry verticals among others. The next step was to validate these findings, assumptions, and market analysis with industry experts across value chains through primary research. Both bottom-up and top-approaches were employed to estimate the global market size for different segments considered under this study. The secondary sources referred for this research study include automotive industry organizations such as the Organisation Internationale des Constructeurs d'Automobiles (OICA), European Automobile Manufacturers Association (ACEA); corporate filings (such as annual reports, investor presentations, and financial statements); and trade, business, and automotive associations. Secondary data has been collected and analyzed to arrive at the overall market size, which is further validated by primary research. Extensive primary research has been conducted after acquiring an understanding of the truck refrigeration unit market scenario through secondary research. Several primary interviews have been conducted with market experts from both the demand- (end user- vehicle owners, fleet owners) and supply-side (mobile air conditioning system manufacturers) across major regions, namely, North America, Europe, Asia Oceania, and the Rest of World. Approximately 20% and 80% of primary interviews have been conducted from the demand- and supply-side, respectively. Primary data has been collected through questionnaires, emails, and telephonic interviews. In the canvassing of primaries, we have strived to cover various departments within organizations, such as sales, operations, and administration, to provide a holistic viewpoint in our report. After interacting with industry experts, we have also conducted brief sessions with highly experienced independent consultants to reinforce the findings from our primaries. This, along with the in-house subject matter experts’ opinions, has led us to the findings as described in the remainder of this report. The bottom-up approach has been used to estimate and validate the size of the truck refrigeration unit market. The truck refrigeration unit market size by vehicle type, in terms of volume, is derived by multiplying the country-level sales of each vehicle type (LCV, medium & heavy commercial vehicle, trailer (container), and bus) with country-level penetration of refrigeration unit (which is analyzed using secondary research and validated with industry experts). The country-level truck refrigeration unit market size, by value, is multiplied with country-level Average Selling Price (ASP) of the refrigeration unit for each vehicle type to get the country-level market, by value. The summation of the country-level market would give the regional level, and then further addition provides the truck refrigeration unit market, by vehicle type- LCV, medium & heavy commercial vehicle, trailer (container), and bus. The top-down approach has been used to estimate and validate the size of the light commercial vehicles (LCV) truck refrigeration unit market, by industry, in terms of volume and value. The global LCV truck refrigeration unit market size, in terms of volume (which is derived from the bottom-up approach), has been derived by identifying the percentage breakup of the refrigeration unit for each industry-wise for light commercial vehicles. Further, regional-level market breakup in terms of percentage for each industry to get the light commercial vehicle refrigeration units’ market size, by industry (frozen food, pharma drugs & chemicals, and ambulance & passenger transport) and region, in terms of volume. A similar methodology has been used to derive the truck refrigeration units for LCV, by type (roof mount & split), and application (frozen and chilled), trailers (containers), by capacity (20 feet, 40 feet, and others), and bus, by size (<8 meter, 8–12 meter, and >12 meter) in terms of volume and value. All percentage shares, splits, and breakdowns have been determined using secondary sources and verified by primary sources. All parameters that are said to affect the markets covered in this research study have been accounted for, viewed in extensive detail, and analyzed to obtain the final quantitative and qualitative data. This data has been consolidated, enhanced with detailed inputs and analysis from MarketsandMarkets, and presented in the report. The following figure is an illustrative representation of the overall market size estimation process employed for this study. This research report categorizes the truck refrigeration unit market based on vehicle type, type, application, industry verticals, bus length, trailer size, and region.